APOSS ssc fee last date 2018, ap open 10th time table : APOSS 10th class fee due dates is released, Check AP Open school ssc exam fee last date 2018, ap open school 10th time table, aposs 10th hall tickets 2018-2019 and ap open school ssc results 2018, All details in this regard available on official web portal www.apopenschool.org. 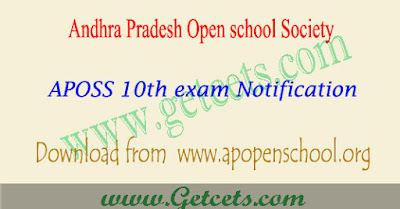 The Andhra Pradesh Open school Society -APOSS has been published due dates for the payment of 10th class examination fee for regular students and failed candidates on official web portal www.apopenschool.org. The students who are going to appeared for ap open school 10th exams would be paid for fees through APONLINE/Mee Seva centers from 28th Dec 2018 and the examination fee would be paid up to 11th Jan 2018 with out late fee. Last date for payment of with late fee of Rs 25 for single subject is 18th Jan 2018. APOSS 10th time table 2018 are available on official website, ap open school ssc exams to be held in the month of April 2018.
at MEESEVA centers Submission of NRs by the AI Coordinator toDEO Submission of NRs by the DCs in the Head Office. The candidates who have enrolled during the academic year 2017-2018 and minimum age is 14 years there is no maximum age. The candidates enrolled during the previous years and appeared for the exams but failed. The candidates enrolled during the previous years but not appeared exams so far.